For over 13 years Best Stainless has been the premier suppliers of Monel K500. Monel K-500 is a precipitation hardenable nickel copper alloy. K500 brings characteristics similar to Alloy 400 in respect to corrosion resistance, however, offers higher yield and tensile strength. Having characteristics of high corrosion resistance, K-500 is an ideal alloy for use in marine environments when the need for constant contact with salt water comes into play. Normally used in a variety of applications, K-500 is widely used for equipment in the production of oil and gas, centrifugal pumps for marine use, as well as propeller and pump shafts. 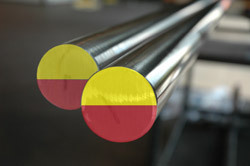 We stock Alloy K500 in a range of sizes and offer this alloy in rod or bar form.